While the P5+1 agreement with Iran is almost certainly a mistake and bad for Israel, there are many ways to avert its potential harms. There are still actions Israel might take to protect itself from attack by Iranian nuclear weapons, including a limited Israeli strike on Iran. In such an eventuality, it would be in the interest of Western powers to retroactively support the Israeli attack, even though they would have prevented it if they could. Their interest would and should be to discourage Iran from hastening to rebuild its nuclear weapons program. For years, the Obama administration has assured Prime Minister Netanyahu that Israel does not have to attack Iranian nuclear weapon production facilities because the US would make sure that Iran would not get nuclear weapons. It turns out that Israel and the US meant different things by the words “Iran would not get nuclear weapons (NW).” The US meant that it would prevent Iran from having physical nuclear weapons in its hand – at least for a decade or so. But Israel feels that it needs to prevent Iran from “becoming a threshold nuclear power (TNP)” – a country that had the materials and ability to produce NW within months. Now the P5+1, led by President Obama, has made a deal with Iran that, if kept, will keep Iran from getting actual nuclear weapons for some time, but will also enshrine and legitimize Iran’s status as a threshold nuclear power. Arguably this keeps the Obama promise, at least for a decade or so, but it doesn’t achieve Israel’s goal (– a goal which is shared by many in the US and by key Arab states). Yet none of the P5+1 governments truly believe that the Iranian program has been or is meant to be exclusively peaceful. They all understand that the main purpose of the Iranian program has been to build nuclear weapons. This creates a central paradox at the root of the JCPOA. One of the main fears of the opponents of the agreement is that Iran will be able to use its status as a threshold nuclear power to gain political advantage in the region and to expand programs of subversion and terrorism. Unfortunately, the agreement allows Iran to simultaneously continue to insist that it is not a TNP and to use the perception that it is a TNP to advance its pursuit of power in the region. (This is like the many Arabs who believe that the 9/11 attack was a Mossad plot, while also admiring Osama Bin Laden for teaching the US a lesson by destroying the World Trade Center). The result is that Israel may have to act alone (or with Arab help only) if Iran is to be prevented from becoming a TNP or obtaining NW sooner than allowed by the agreement. Now that the diplomatic approach has failed, Israel has three possible approaches to blocking the Iranian NW program. One approach is employ covert action to set back the Iranian program – such as new types of “Stuxnet” computer viruses and other sabotage in Iran. A second approach would be measures to increase the chance of popular Iranian actions against the revolutionary regime that has ruled Iran since 1979. A third approach would be to launch a military attack against some of the NW production facilities in Iran. Covert actions against the Iranian program are not politically difficult – although they probably would face objection by the US. But it may not be feasible for Israel to achieve much with more such measures. Although several knowledgeable people have in the past urged Israel to take measures to increase the chances of a popular Iranian uprising against the current regime, the Israeli government has thus far generally rejected efforts in this direction. Now that the hope of diplomacy solving the NW problem has disappeared, perhaps Israel will give more consideration to this approach. While certainly there is nothing Israel can do that has a high likelihood of leading to the prompt overthrow of the Iranian regime, there almost certainly are relatively low cost measures which are likely to move things in the right direction. It is widely thought that Israel has lost whatever opportunity it had to make a military attack that would cause serious damage to the Iranian weapons program, both because of the diplomatic protection provided to Iran by the agreement and because of improved Iranian defenses. Of course I do not have the technical and military information to make any kind of judgment about how much could be accomplished by an Israeli military attack. But the Israeli government continues to insist that, if Israel believes that such an attack is necessary to protect Israel from an attack with nuclear weapons, it has the right and duty to make such an attack. While Israel could probably not inflict enough physical damage by a military attack on Iran’s nuclear production facilities to permanently prevent Iran from building nuclear weapons – this is not the end of the story. If there was an Israeli attack causing substantial damage to some of the key Iranian facilities, the Iranian government would have to decide at what pace to overcome the damage. In their internal debate about how to respond to the setback in their plans, Iranian leaders might be influenced by international reaction to the Israeli attack. The Obama administration has made it clear that it opposes (one might say, “forbids”) an Israeli attack, and has probably taken actions that increase the difficulty of making an attack. The European democracies also oppose an Israeli attack. But after an attack is actually carried out, and can no longer be prevented, a different issue is presented to the democracies. They have to decide whether to condemn or support the attack. If they believe – as they do – that it is greatly against their national interest for Iran to acquire nuclear weapons, then their reaction should be retroactively to support the attack, even though they would have prevented it if they could. Their interest will be to express or create a political reality that might discourage Iran from hastening to restore its nuclear weapon building program. If the democratic world refuses to condemn the attack and instead tells Iran that the attack was its own fault for building nuclear weapons and threatening to destroy a UN member state – some in the Iranian leadership might come to doubt whether they would ever be able to produce nuclear weapons. A military attack on Iran’s weapon production complex might also have an effect on Iran’s internal politics. Of course it is possible that it would increase unity behind the government,. But it may be more likely that a strike would increase the feeling that the Iranian government is harmful to the country, and that it is not as strong as it seemed to be, and that there is a lot of external opposition to the government. This view of the national interest of the West concerning how to react to an Israeli attack it had tried to prevent may be sound. But it is not at all clear that Western governments could quickly recognize their interest and suddenly reverse from discouraging an attack to supporting it after it is carried out. But no one should be confident that the democracies would not do what is in their interest at the time – despite significant antagonism to Israel. While some retaliation against the attack can be expected, there would be much deterrence limiting the amount of Iranian retaliation – especially if key democracies refused to condemn the attack. If fact, even now, the Iranians don’t lack reasons to attack Israel, yet they are prevented from doing so by deterrence. Much of this deterrence would continue to exist, I believe, after an Israeli attack on the Iranian nuclear program. If because of Israeli deterrence, and perhaps Western warnings, the Iranian regime failed to implement the ferocious threats it has made, some Iranians might come to doubt the strength of the regime. It should be clear that I am not recommending a military attack on Iran’s nuclear program. It would be a dangerous move and there are many good reasons that militate against it. On the other hand, there are a number of ways even an attack that caused only limited physical damage might indeed prevent Iran from ever getting nuclear weapons. And the increased likelihood that Iran will acquire nuclear weapons in the not-too-distant future is also dangerous. Therefore, one of the results of the bad P5+1-Iran agreement is to increase the likelihood that Israel will take military action against Iran’s program. This is one of several reasons why the agreement, although definitely a dangerous mistake, will not necessarily lead to a disaster for Israel. 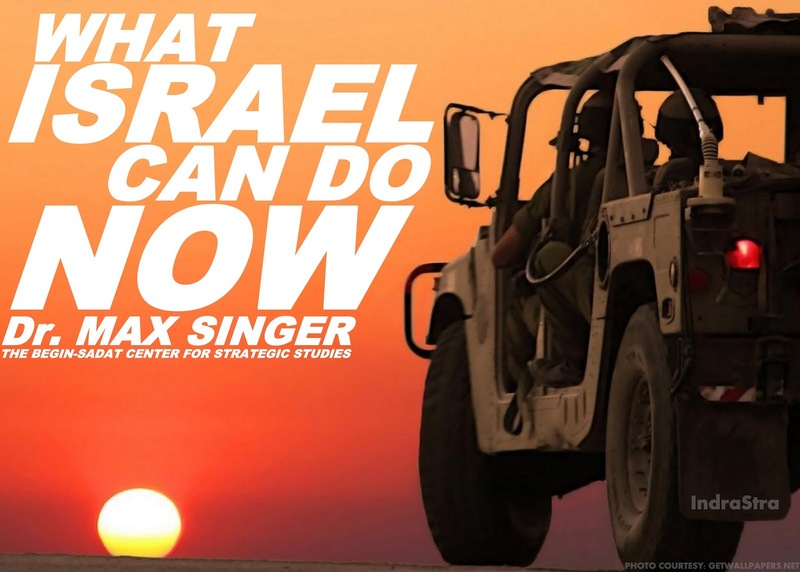 Dr. Max Singer is a founder of the Hudson Institute and a senior research associate at the Begin-Sadat Center for Strategic Studies. He specializes in US defense policy, Middle East affairs, and long-term economic development.